There are 6 reviews of Larmes du Désert. i spent the morning trying to recreate this fragrance with my arsenal of oils and absolutes. experimentation is my favorite form of learning. i pulled out all my resins to match this fragrance. frankincense, styrax, cedarwood, elemi, guiacwood, oponax, myrrh, sandalwood, balsam of peru, tonka bean and labdanum. arctander desribes many of these essences as having a balsamic essence and or being used in powder type perfumes. i added a smidgen of patchouli, cardamon and clove to add spice. a bit of bergamot and orange to bring up the sweetness. i get a decidedly powdery-soft smell from larmes du desert. it smells to me like an imagined sandalwood. my creation is no match. whatsoever. i am going to stash this blend and smell again in a month. voila the missing ingredient is ambrocenide. i kept on smelling larme du desert and it finally dawned on me that the powdery smell was ambergis. i am not a fan of synthetics but i now know that this may be what makes many commercial fragrances impossible to replicate using natural materials. Incense & cypress blend well for an uplifting beginning. Dry. Piercing. My good friend patchouli is here in spades. The woods here are sublime. Well integrated. Smooth. Resinous. Sweetly balsamic. It reminds me of a combo of Sahara Noir and one of the Guerlain Les Desert d'Orient releases. This is an alluring, calming fragrance. No choppiness at all, in its composition. The incense is not overdone. Expertly mixed. No complaints. Lasts and lasts. A bright, aromatic opening with lemony frankincense & coniferous woods is soon joined by ambery, resinous notes. I agree with other reviewers that this has an agreeable warmth to it that's lacking in some of the darker or more austere incense fragrances out there. And unlike those, I think this one would be easily wearable in warm weather. Over the first couple of hours, it smooths out & sweetens a little as the benzoin becomes more prominent, & it settles into a comforting, fuzzy golden aura. The projection is not massive, but the fragrance makes its presence felt in a most enjoyable yet undemanding manner. Nine hours in it fades closer to the skin, but lasts an outstanding twenty-two hours on me. A very nicely balanced incense, this one, & easily unisex. Perhaps if they left out the gold flecks & made it more affordable, it might even have been bottle-worthy. As its name indicates, Larmes du Désert is all about resins. Olibanum, myrrh, labdanum and benzoin all make an appearance, but most of the time, they're seamlessly interwoven into each other and merely show a certain facet from time to time. The fragrance opens with the bracingly cool and stony smoke of olibanum, flankered by the musty sizzles of myrrh and the aromatic woody freshness of cypress. However, Larmes du Désert does not feel as aloof or austere as Avignon or L'Eau Trois for example. Because there is this mild balsamic and fleshly warmth of labdanum and cinnamon-tinged benzoin that soften the overall harshness of incense. There is also a discreet plum-like sweetness lurking in the background, although I don't know where it stems from. As a result, Larmes du Désert is like a fantasy painting of desert, where one can admire the tawny landscape but doesn't have to endure the hardship of an actual desert. Like most Atelier des Ors perfumes, Larmes du Désert is largely linear during its 10-hour longevity, although the sillage is rather soft except for the moderately projecting first hour. While I personally prefer an incense fragrance with a more stark constrast between its coldness and warmth, Larmes du Désert is nontheless very enjoyable and solid. Its strength actually comes from the unification of the cold incense and warm amber and its smooth execution. If you happen to be looking for an elegant and verstaile incense fragrance, Larmes du Désert might well worth a try. What a mesmerizing woody-resinous composition my Lords!!! I agree with the always excellent Buzzlepuff since I notice a great game of proportions and balancements, despite "handling" resins in perfumery is never particularly easy. Resins and spices are in here sapiently calibrated while the dominant woods smell dry, smoky, peppery, seasoned, secular. This misty and moody Atelier Des Or's woody/incensey fragrance (especially if taken in its top and central stages than in its starker dry down, more than Sahara Noir or L' Air di Desert Marocain) conjures me up the medieval Etro Messe de Minuit first formulation with its sacramental secular rituality, with its atmosphere of damp-moldy secret basements, burning torches, tight alleys of the medieval town and religious ceremonies. While Messe the Minuit appears more properly resinous, spicy and "burning" with its holy liturgical cremation of resins (frankincense and opoponax), Larmes du Desert is (initially more balsamic, than finally) more woody, arid, smoky and subtle (basically more austere and balanced with its silent perfect secular burnt abstraction). One of the woodiest scents I've tested on skin in which the straighforward woodiness smells finally almost (ostensibly) salty. This French House is one of the most experienced and qualified Maison in the woods/resins-appointments out there. Another eccellent fragrance from Atelier Des Ors. This is an incense and amber fragrance of truly excellent proportions. The combination of warmth of labdanum and benzoin seamlessly blended with the radiance of a patchwork variety of resins is pure cozy comfort. The scent is rich dense fabric of layered cedar wood, patchouli, gaiac wood and cypress woods woven tightly with self radiant golden strands of ambered frankincense and benzoin. What a mesmerizing product. There are similarities to Sahara Noir as well as L'Air du Dessert Marocain but Larmes du Desert lives up to any comparison. Rating: 8.5 of 10 stars. 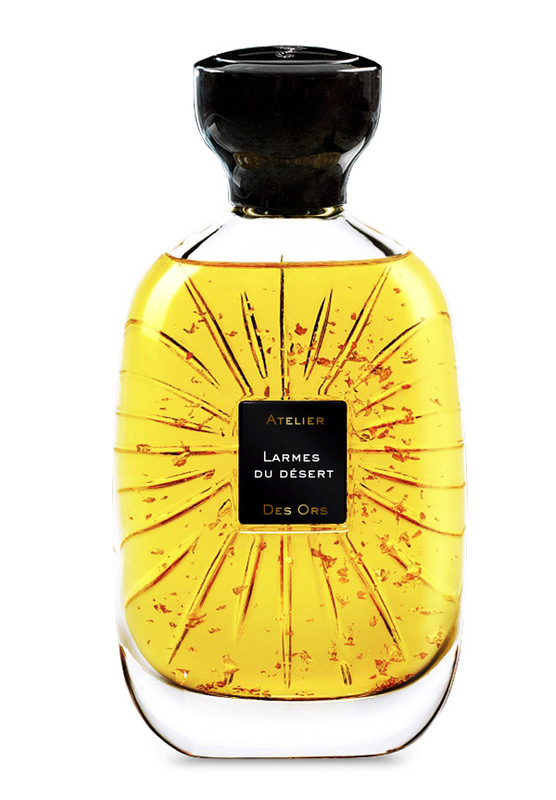 Atelier Des Ors Larmes Du Desert 100ml EDP Sealed, Authentic from Finescents! There are no member images of Larmes du Désert yet. Why not be the first?